Riley Keough co-stars in the film sometimes referred to as "Happy Valley." 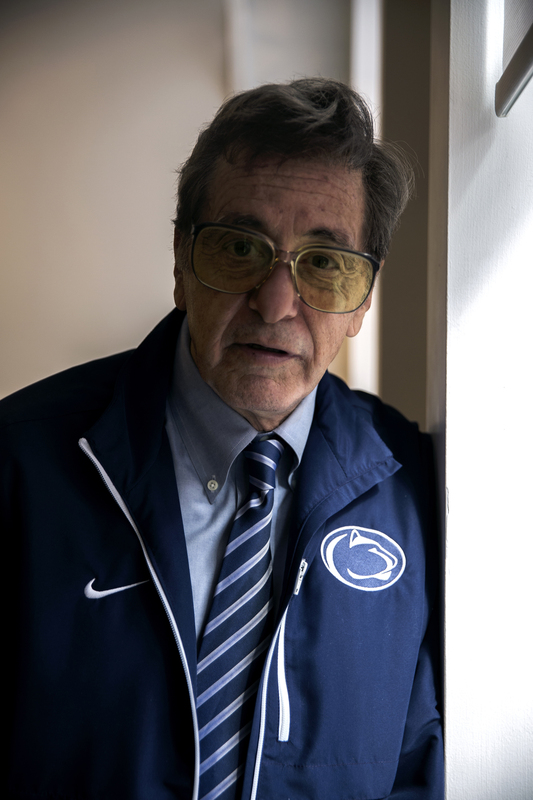 If the words “Untitled Barry Levinson Project” don’t get you excited, then perhaps this first-look photo of Al Pacino as Joe Paterno in the upcoming HBO movie will. Pacino is playing the disgraced coach who was best-known as the winningest coach in college-football history before becoming part of the Jerry Sandusky scandal in late 2011. JoePa, as he was sometimes known, served as head coach of the Penn State Nittany Lions from 1966 to 2011 and racked up 409 wins during his decades-long tenure. Sandusky, the team’s defensive coordinator, was convicted of 45 counts of sexual abuse of young boys in June of 2012 — five months after Paterno’s death from lung cancer at 85. For his alleged role in helping cover up the years-long scandal, Paterno had 111 of his victories vacated by the NCAA. Levinson, who won an Academy Award for directing “Rain Man” and has received five other nominations, previously worked with Pacino on “You Don’t Know Jack” and “The Humbling.” Riley Keough, Annie Parisse and Kathy Baker co-star in the untitled project, which is currently in production.